My home office is my personal little haven, but it pales in comparison to the home office inspiration found on Pinterest. You don’t have to invest in crisply painted built-ins, a huge amount of square footage, and industrial-chic touches. 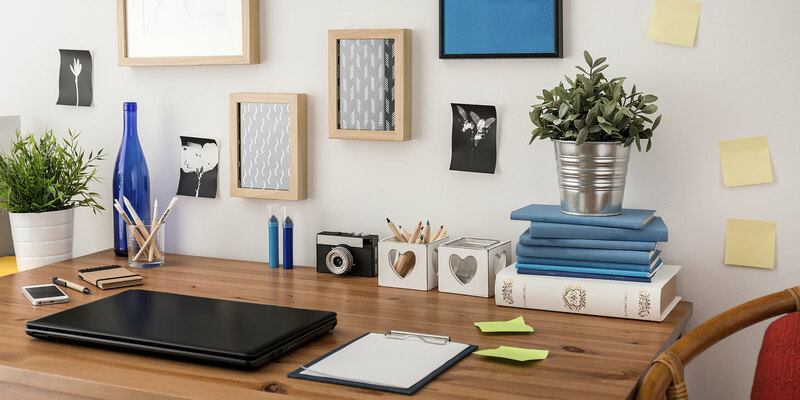 Instead, there are some small tweaks you can make to turn your workspace into a happy place. These concepts are borrowed from feng shui. It’s “the art and science of designing harmonious environments based on the profound Chinese understanding of how people are connected to and affected by their close surroundings,” according to the Professional Register for U.K. and European Feng Shui Consultants. The practice can foster a harmonious working environment, which can spawn other positive benefits. I used to constantly arrange and rearrange the furniture in my home office, trying to nail down the right furniture layout. I just wanted to feel like everything was jiving well. I didn’t breathe a real sigh of relief until I tried out this time-tested feng shui principle: don’t sit with your back towards a door. The thinking goes that you want to find the commanding position for your desk in your home office. In feng shui, that position includes facing the door. If you can’t face the door in your home office, don’t give up! Cheryl Janis, a blogger and self-proclaimed self-care interior designer, shares a popular suggestion: Place a mirror on your desk to allow you to see what’s behind you, including that pesky door. Why face the door? The idea is that it helps you “command” your energy. You’re freed up to do your best work because you don’t have to worry about potential threats entering through the door unseen. I wasn’t too worried about guests to my home office — but moving so I could see the door did give me a little bit of extra bandwidth to focus on my work. When I moved my chair to prevent myself from sitting with my back to a door, I also had to move my desk. For me, this meant the added benefit of breaking it free from the wall it was pushed up against. A desk against a wall, it turns out, is another feng shui no-no as it conflicts with the desk’s commanding position status. The command position includes having a wall behind you and not in front of the desk. That wall placement represents stability, among other things. It offers symbolic support and keeps all the energy in the room for you, rather than letting it flow out. Facing a wall can also be thought of staring at a barrier all day…not exactly motivating. If the setup of your home office prevents you from having a wall behind you and your chair is up against a large window or open space, you have another option. Feng Shui and Beyond recommends opting for a high-backed chair for a little bit of symbolic support. And if you do have to face a wall, About Home suggests showcasing artwork or inspirational photos. There’s another aspect of your home office that can help you optimize for increased energy and productivity. But it doesn’t involve moving furniture. It’s sound, writes Linda Varone, a feng shui interior designer, in Entrepreneur. While the sound of co-workers chattering on the phone in a large open office can get annoying, “sound is energy,” she writes. In a home office, the sounds of family members, neighbors, or high-energy pets can feel distracting. Music or the sounds of nature can help with that positive energy, Varone writes. That energy can then boost your creative juices. A 2012 study published in the Journal of Consumer Research found something interesting. While a high level of noise can reduce creativity, moderate ambient noise can enhance performance enhance it. If you miss the background noise of people chatting, you can recreate the sound right in your home office. Coffitivity lets you choose the background sound of your choice: morning murmurs, a lunchtime lounge, university undertones, and more. With those three simple tweaks — moving your chair so you can see the door (or getting a mirror that lets you do the same thing), making the most of your office walls, and pumping up the ambient noise — you can turn your home office into a more pleasant and productive workspace.